The Network of Schools of Public Policy, Affairs, and Administration recently held its annual competition involving a simulated global crisis that students are expected to manage. 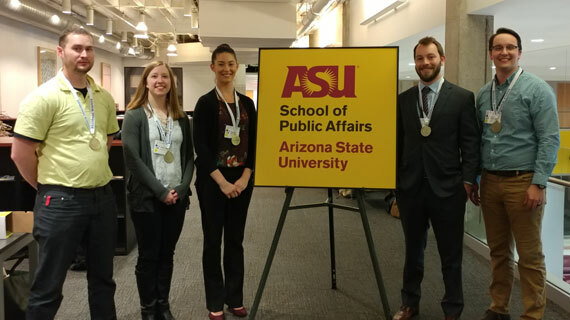 Benjamin Bass, a Master of Public Administration (MPA) student from Southern Utah University, had the opportunity to travel to Arizona State University with two other MPA students and compete in one of 20 regional competitions worldwide, the largest-ever student simulation competition in higher education. The participants were nominated by the director of the MPA program, Angela Pool-Funai, to compete in this year’s competition. NASPAA’s mission is to ensure excellence in education and training for public service and to promote the ideal of public service. The annual simulation provides a real-world application of public administration tactics. Each year participants are expected to manage the crisis efficiently and effectively. This year’s topic was biological outbreaks. As a member of a five person team all from different universities, Bass got to fill several different roles as his team rotated to represent each of the four countries in this fictitious world. The positions included prime minister, minister of finance, minister of commerce, minister of public health, and a World Health Organization representative. Each position has a unique role in stopping, preventing, and containing the outbreak. Team members had to work together to decide the best policy options for the scenario. Policy options included social distancing, which means closing schools and quarantining infected individuals and areas, various travel restrictions both locally and internationally, distribution of healthcare tools, and emergency revenue generation. Bass and his team won the regional competition and their work was submitted to the “super judges” to be evaluated against other regions around the world. Benjamin’s team took second place out of 116 teams at 15 sites across the globe. He will receive $500 in prize money as a member of the 2nd place team. SUU has placed a bid to host the competition in the future and Bass heavily recommends forming a simulation class to help SUU students and faculty prepare to host. “The realistic simulations would better prepare SUU’s MPA students to function in the real world,” said Bass. In preparation for the competition, Bass studied previous biological outbreaks and how they were handled by officials. He also familiarized himself with the current policies and tactics of the Center for Disease Control so he could be a contributing member of whatever team he was placed on. “The MPA program competencies that I have been learning throughout my studies helped prepare me for the competition,” said Bass. With his eyes on the future, Bass plans to work with the Bureau of Reclamation as a contracting specialist/officer for as long as he can. He hopes to volunteer on various committees for whatever city he resides in and eventually run for an elected position when the time is right. Learn more about the Master of Public Administration program.